Running your Coil Winder Machine on a small computer! We get asked a lot if our Coil Winding machines can run standalone and the answer is NO due to it needing a computer to run the software. The next question is can it run on a Apple Mac and again the answer is NO because our software has been developed for PC based systems. So the conclusion usually is that the customer either uses their existing PC to run the software or buys a Laptop/Desktop to run the software. The latter option can be expensive and add to total cost. But what about having a small dedicated computer that takes up nearly no room and which is very low cost! Well the answer is now YES ! The Raspberry Pi is a series of credit card-sized single-board computers developed in the United Kingdom by the Raspberry Pi Foundation to promote the teaching of basic computer science in schools and in developing countries. The original model became far more popular than anticipated, selling outside of its target market for uses such as robotics. 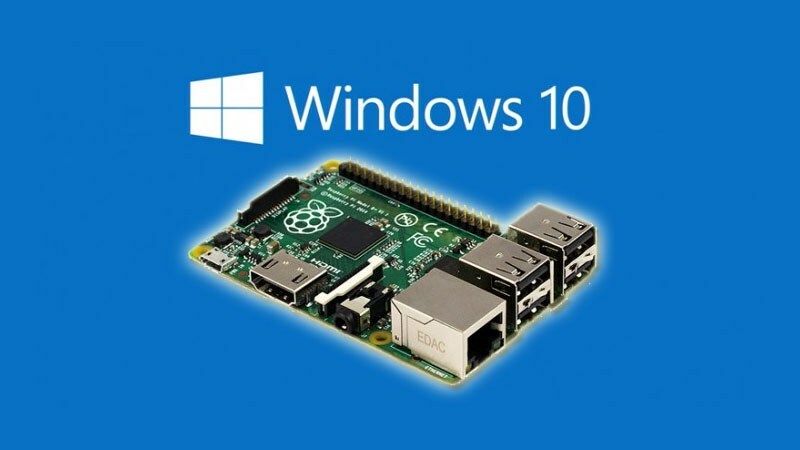 Windows 10 IoT Core is a new edition of Windows targeted towards small embedded devices and maker boards such as Raspberry Pi2 or Pi3. IoT core is designed to work with low-level bus interfaces such as Serial, I2C, SPI, USB. 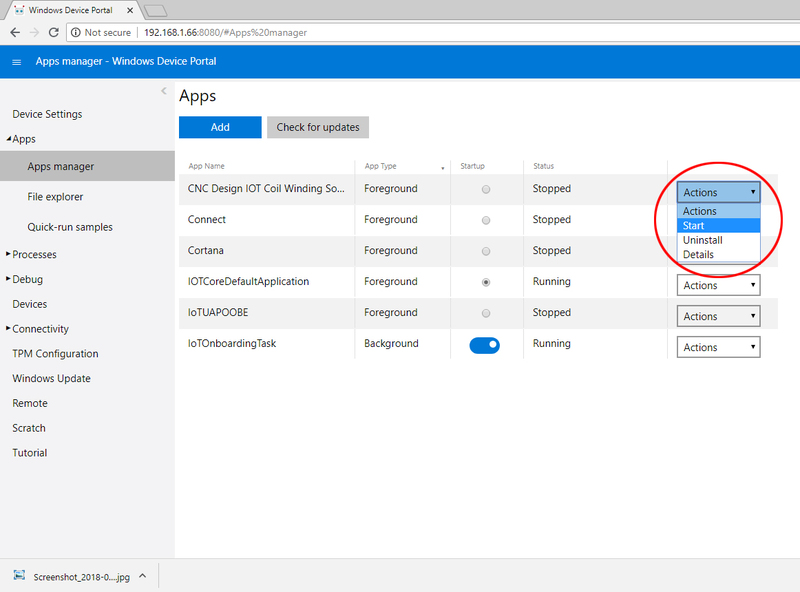 You can write a Universal Windows Application using a variety of programming languages in Visual Studio to rapidly create maker projects. 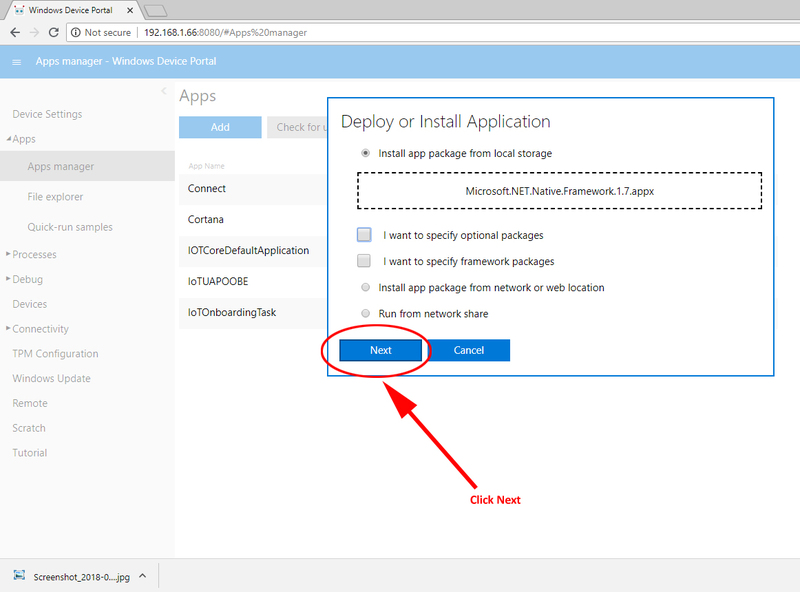 Running a dedicated application in a Windows 10 sandbox is pretty cool and more information can be found on the following link which includes how to setup the development environment for your Raspberry Pi. 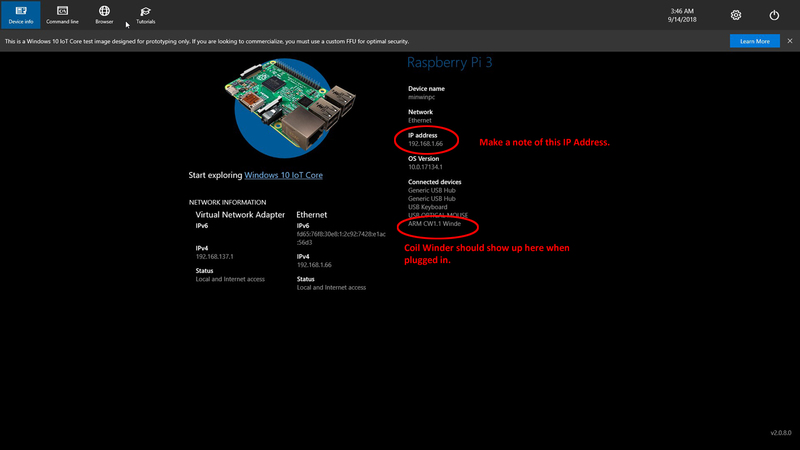 First thing you have to do is install Windows 10 IOT operating system onto your Raspberry pi. We will not cover how to do this on this page as there are already plenty of pages that will take you through the steps. Here is the official way to set it up. 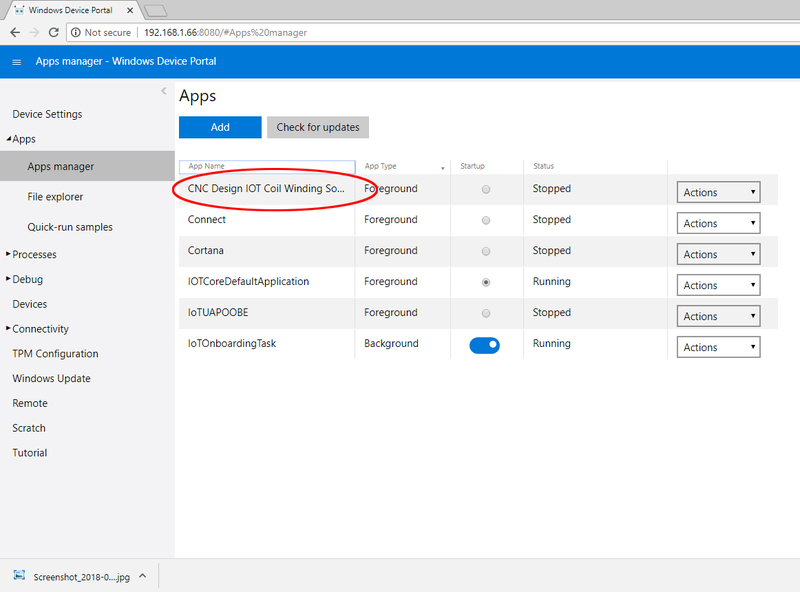 Now you have Windows 10 IOT installed on your Raspberry pi, it is now time to install the UWP Coil Winding software. You can plug the your Coil Winding machine (Must have ARM Controller MKII ) into a spare USB port on the Raspberry pi. Once you power up you should see something like the following screen shot. Next launch your web browser and type in the IP Address of your Raspberry pi. Make sure you add the port number. This will take you to the Device Portal. First we will need to install some dependencies and then the application. 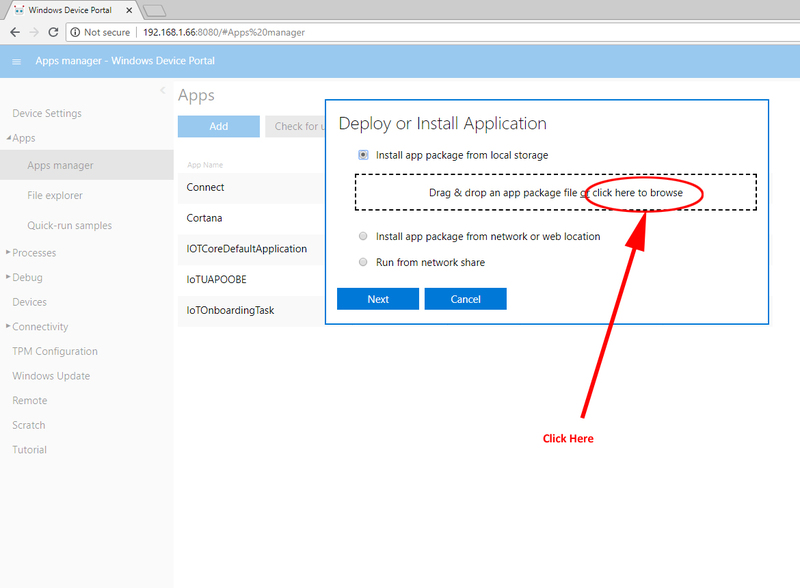 Click the Add button and the Deploy or Install Application box will appear. 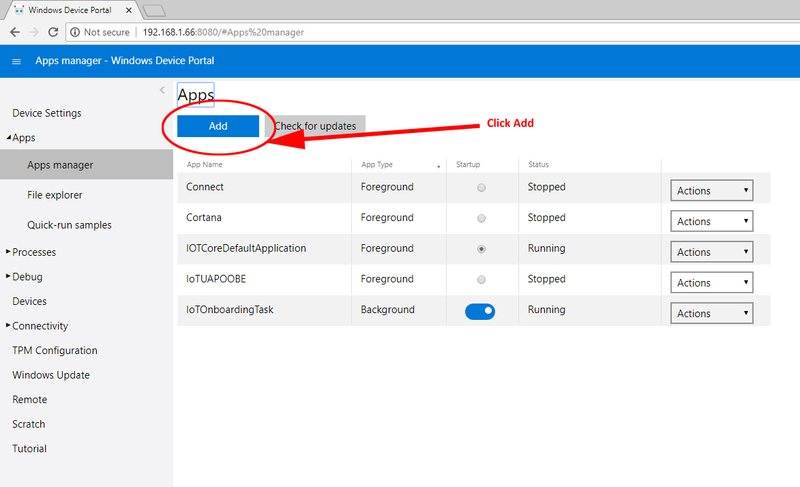 Click as shown above and use the Explorer window to find the application package. 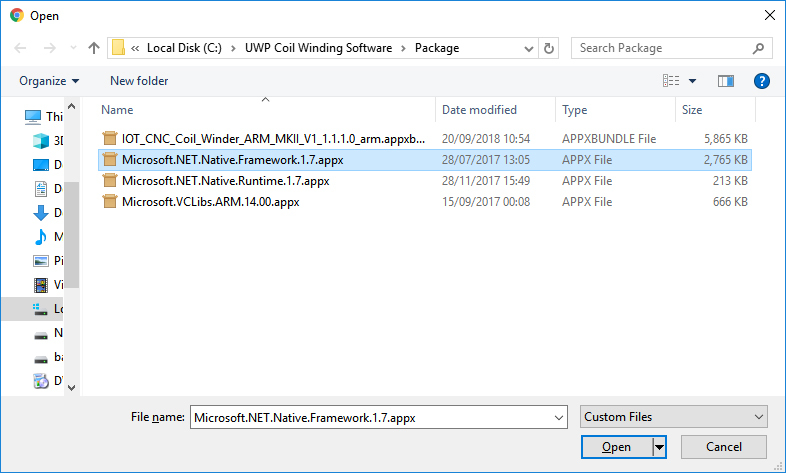 First Select the Microsoft.NET.Native.Framework.1.7.appx and Click Open. Now click the highlighted button "Next". You may get an error saying you have a newer version installed and if so then this is fine and you can ignore. Now you have the dependencies installed you can now install the main application. Once it has completed you should now see the Application appear in the list. 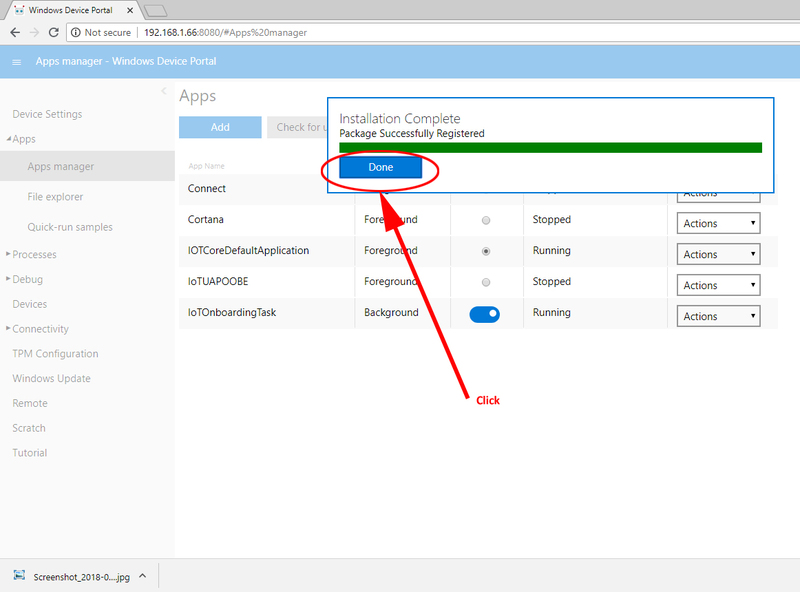 Now we can start the application running by clicking on the actions and choosing Start. Your Monitor connected to the Raspberry pi should now show the application running. 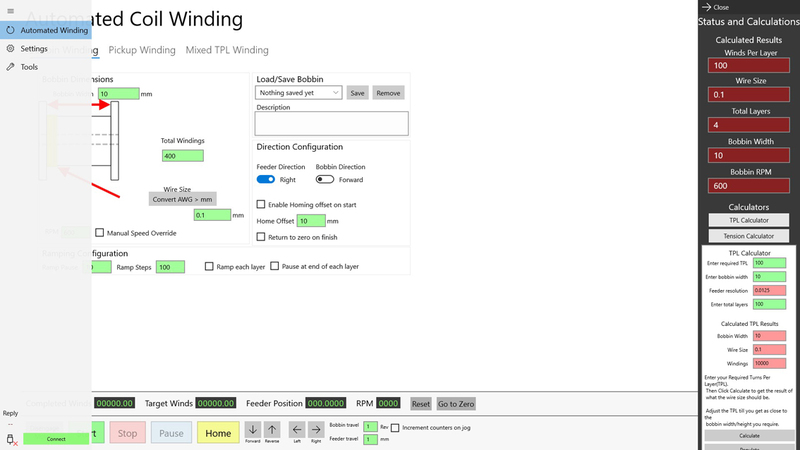 Now make sure your Coil Winder is connected via USB then click the Connect button which is down the bottom left of the screen and away you go. We have published the manual online if you get stuck just follow the link below. Final thing left to do is to make the application start when the Raspberry pi is turned on. 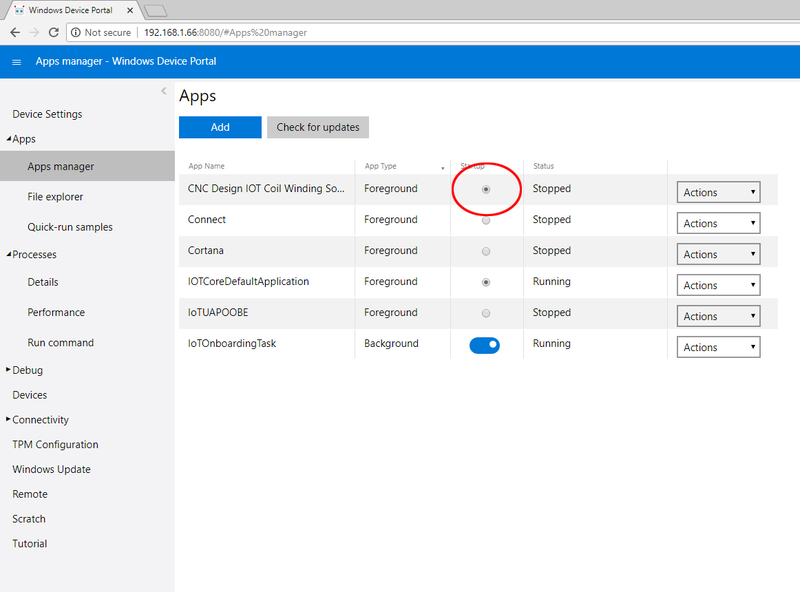 You can do this by clicking on the Startup radio button next to the application name.